The purpose of a moon phase dial – like the time dial that tracks the time through the day, is to keep tract of the moon’s position as it travels around the earth, every 291/2 days – which is one lunar month. The moon has no light, so what we see looking at the moon is the Sun’s light reflected from the Moon’s surface. Consequently as the moon travels around the earth, the amount of sunlight reflecting from its surface changes; giving us eight distinct phases we can easily identify. When the moon is moving away from the sun, the amount of light on its surface increases and we see more of the moon; until it reaches it furthest point away from the Sun and we see the whole (full) moon. 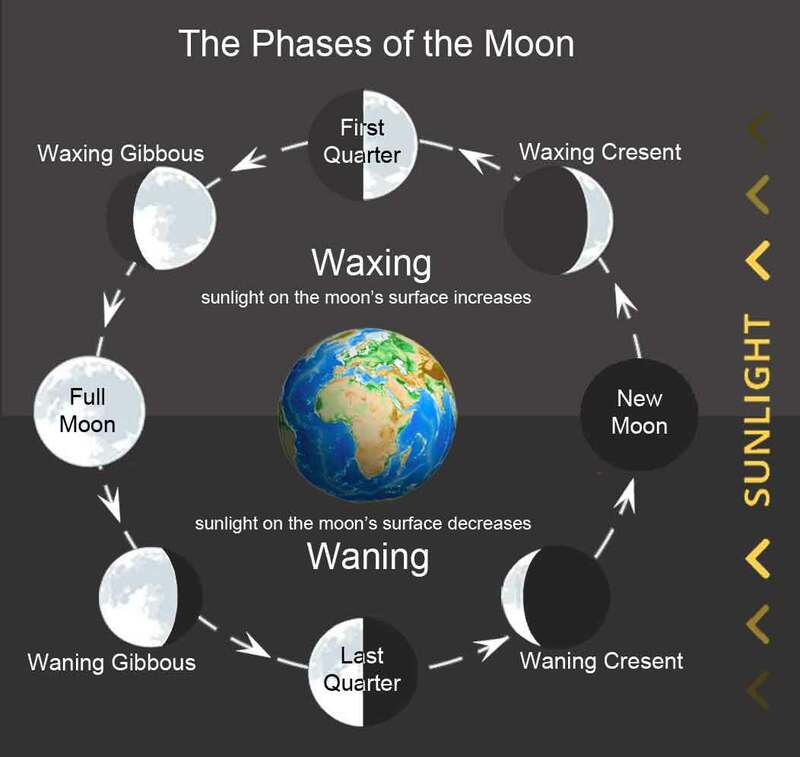 We call these phases “waxing” (increasing light). On the other hand when the moon is moving toward the sun the amount of light on its surface decreases and we see less of the moon. We call these phases “waning” (decreasing light). The moon phase dial is designed to show the shape of the moon as it appears in the sky, the number alongside it being the lunar date – from the lunar calendar, which as mentioned above is 291/2 days. Typically a moon phasedial consist of a round disk displaying two pictures of the moon. One half rotation of the disk occurs every 29.5 days – one lunar cycle. The Full Moon always occurs on the 15th day of the lunar calendar. Position the moon phase dial so the moon is in the centre of the display, with the number 15, above it on the moving disc, showing (or under the number15 showing on the arch above the dial). Count the number of days past the last full moon on a calendar. Turn the moon phase dial Clockwise one click for each of the number of days past the last full moon. If the moon phase dial will not rotate, wait a few hours and try again. The moon dial should move easily so never force it to move. It may be in the 3 hour movement cycle; therefore wait a few hours and try again; you should then be able to easily move it. Example 1: If today was a full moon, the moon image on the dial would be centred in the display below the 15 on the dial, or the 15 on the arch above the dial. There are two moons on the dial and it makes no difference which one is under the 15. Example 2: If the last full moon was 10 days ago, Once the Full moon is centred in the display below 15, move the dial clockwise 10 clicks – one for each day since the last full moon. If the Clock with moon phase dial stops for more than 24 hours, the moon dial will also stop, and must be reset when the Clock is started again. Moon Phase Dails can be found on table, wall and floor clocks. Here is link to a Grandfather clock with a Moon Phase Dail.